That is a rendering of Mira in Space Engine 0.9.8, a screenshot I snapped from within the software. 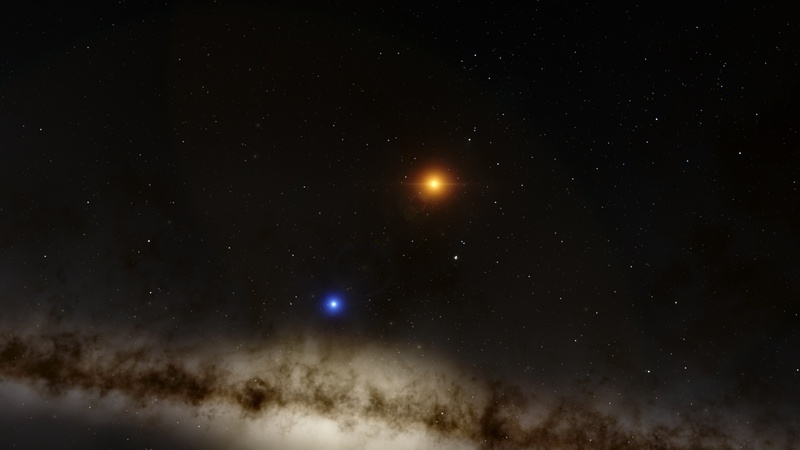 Mira is the Bayer designation for Omicron Ceti (ο Ceti), a symbiotic binary star system about 300 light years from Earth in the Cetus constellation. Mira A is a red giant star, and Mira B (VZ Ceti) is a white dwarf. With that out of the way, let’s get back into the build. As functional as the Zalman chassis has been, I decided I didn’t want to keep with it for this build. But for the switch, I still required another mid-tower chassis with water cooling grommets. And the pickings weren’t all that great. In the Corsair lineup, I was really impressed with and considered the Carbide Clear 400C as it provided for a full side-window. But without water-cooling grommets, the case would have to be modified or I’d have to find a different way to route tubing to get it through a Koolance PCI L-bracket. The same with the very impressive Crystal 460X (plus it’s available from only 1 reseller at the time I write this, and they were out of stock). The grommets on the Obsidian 450D also aren’t grommets but merely holes in steel, and they were too large to fit any pass-through fittings on the market. So I looked at NZXT and Fractal Design. Fractal Design doesn’t have any chassis available with water cooling grommets, so they were out. And looking at NZXT, the only options I considered reasonable were the S340 and H440. Only one of which has water cooling grommets on the back. Any guesses as to which? 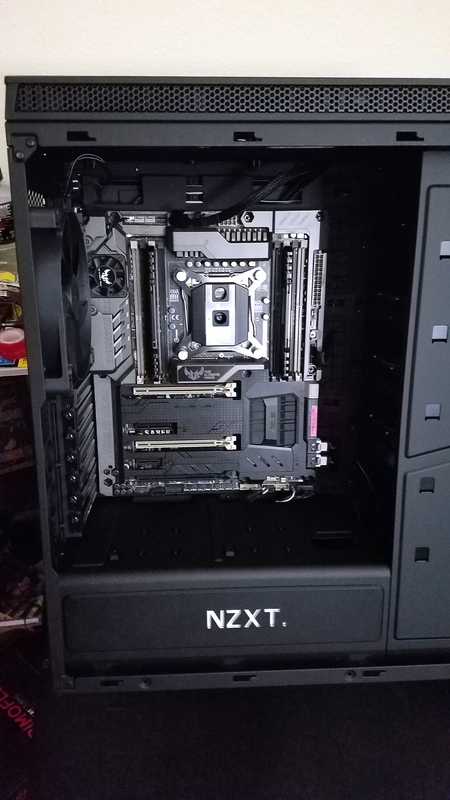 An all-black NZXT H440 was the selection. The size of the water cooling holes is the only downside with this chassis as the holes with the grommets removed are too large for any pass-through fitting available. And while I considered trying to find an alternative means of mounting the fittings into the holes — e.g. using washers — I decided to go with a different route that will actually cut down on the number of fittings that will be in use. But there was another reason to lean toward this that became apparent when I was researching the chassis. I have four (4) 1TB Western Digital Blue drives left over from another project that never panned out. The H440 has plenty of room to set the drives while allowing for adequate airflow around all of them. And the Sabertooth X99 has plenty of SATA connections. The only question is RAID 0 or RAID 10. And through the BIOS or through Windows. So after buying the H440 at my local Micro Center, I started building the system into it. And I decided to violate the cardinal rule and not test the hardware before installing the water block — I’ve never had to return base hardware on the system, so I’m not worried. Only the graphics cards and power supply are going from β Ori. to Mira. And the fittings as well. Everything else is getting set aside to be used for something else. Not sure what just yet. But getting the system finished requires tearing down β Ori. So the next update to this will come after Mira is finished and up and running. For now, here are some benchmarks I gathered on β Ori. I’ll provide the comparisons to Mira once everything is running. For immediate reference, the system is an AMD FX-8350 (stock speeds) with 16GB RAM and two GTX 770s in SLI.